Those planning car events often face the dilemna of whether simply to return to the same venue time and again, or whether in the interests of keeping things fresh, they should try to find somewhere different. Most of the larger events that take place in the UK are firmly anchored to the same venue, and for good reason, or indeed reasons, ranging from the fact that there are features, facilities and attributes that are unique to many venues, much of the infrastructure ranging from ticketing to on-site facilities are in place are a known entity to arrange. But for the Car Club looking to run their own private event, there are more choices. Not perhaps as many as you think, as many of the “best” locations are in demand from other Clubs and indeed non-Car events, and there are plenty of potentially interesting venues who are not particularly receptive to the idea of a Car Club on site. Couple that with the fact that to attract a sizeable attendance, then you need to find somewhere that is easy to get to. So for a national gathering, that means that the middle of the country is likely to attract a bigger turn-out than one near the coast. And so, having held a couple of Abarth-specific events at the Coventry Transport Museum in 2016, it was perhaps not a surprise that there should be another one there in 2017. Coventry is, after all, more or less in the very centre of England, and is not far off several of the country’s major motorways, so within a couple of hours drive for a lot of people (though some did come from far further away than that!. 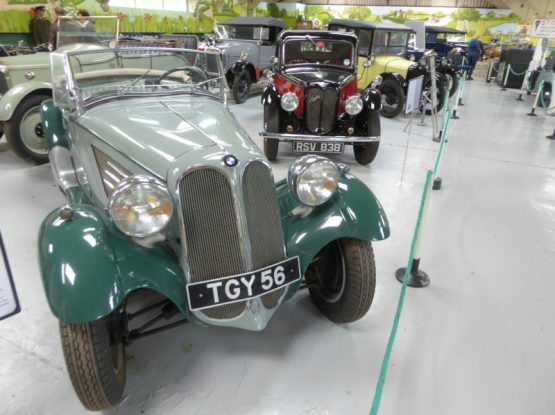 There’s ample space, which is available at no cost, and the site has the advantage of having a car museum on hand for some indoor entertainment, as well as plenty of eating and drinking places within walking distance. Oh and even shops, if – heaven forbid – someone should prefer that to looking at and talking cars! Just as was the case for the second of the 2016 events, this one was organised by the Modified Abarth group, which meant that apart from some help in promoting the event across the other online Abarth communities, all I had to do for this one was to turn up. As you can see from the glorious blue sky that features in most of the photos, the weather Gods were particularly kind, bathing the event in the sort of summer’s day that we all dream of, but don’t always get. 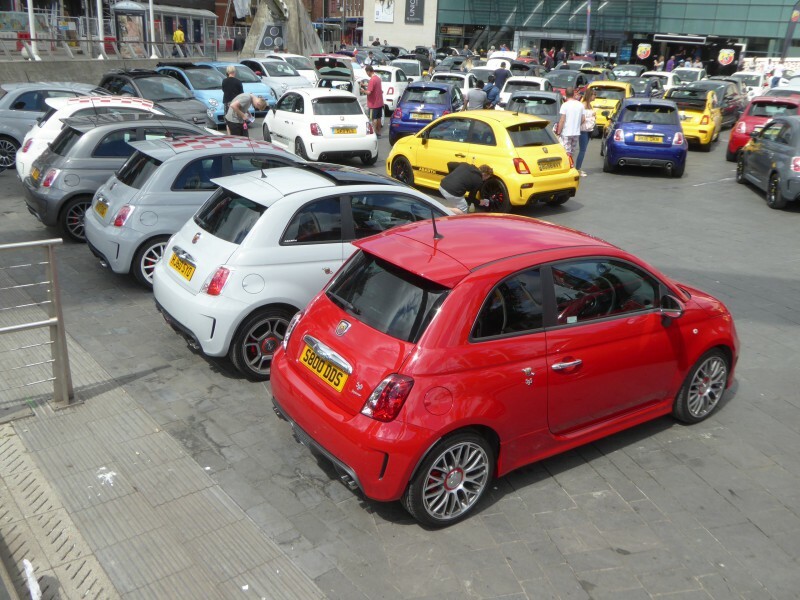 And so Abarth owners came, en masse, from all over the country. Well over 100 cars, with the result that Millennium Place, the area in front of the museum was completely full by late morning, and that number were accommodated because cars were parked carefully to ensure that most people would be free to extricate their car and leave when they wanted to. Though few did, until well into the afternoon. There were too many cars and people to catch up with for many to feel the desire to leave earlier than that. So here was what was on show. Local dealer, Research Group of Nuneaton, brought along one of the Abarth event caravans and a couple of examples of the latest product. These were the 695 XSR Yamaha Limited Edition and the Yamaha XSR900 Abarth motorbike. Not perhaps the most obvious pairing until you remember that for the third year running, Abarth are the Official Sponsor and Official Car Supplier of the Yamaha Factory Racing Team which will be competing in the 2017 FIM MotoGP World Championship. So following on from the Abarth 595 Yamaha Factory Racing and the 695 biposto Yamaha Factory Racing Editions that they have already made, there is a new limited edition car, the Abarth 695 XSR Yamaha Limited Edition, available exclusively in Pista Grey. Just 695 hatches and 695 convertibles will be made. The new car was created to celebrate the Yamaha XSR900 Abarth, which is the first exclusive motorcycle to spring from the collaboration between the two brands and which sports the same grey livery with red trim as the 695 XSR, as well as sharing many of its features. The special series makes extensive use of carbon fibre to demonstrate its affinity with the front fairing, front mudguard and saddle cover of the two-wheel Yamaha. The Abarth 695 XSR and the Yamaha XSR900 Abarth also share Akrapovič ultralight exhaust developed in the racing world to boost the personality, sound and performance of both vehicles. On the Abarth car, the carbon fibre tailpipes enhance the looks and technology of the exhaust system. The XSR logo on the tailgate distinguishes the Abarth 695 XSR, while an aluminium badge identifies the sequential number of 695 units for each body type. Other carbon fibre details, in addition to the mirror caps and Akrapovič tailpipes, are available as optional equipment, such as dashboard fascia, pedal covers, gear knob and kick plate. A 1.4 T-Jet engine delivering 165 HP sits beneath the bonnet. Equipment on this special series includes Koni rear suspension and Eibach springs, 17” Supersport alloy rims with Matt Black finish, Satin Chrome accents on handles and badge supports, red details on bumpers and mirrors, red brake callipers and a braking system with perforated discs. This version can be customised even further using the tuning kit to increase the power to 180 HP, improve handling by fitting a Koni front suspension with FSD (Frequency Selective Damping) valve and make braking even prompter with 305x28mm perforated and self-ventilating Brembo floating front discs with high-performance Ferodo HP 1000/1 front brake pads. It also features the new UconnectTM 7″ HD LIVE system integrated with Apple CarPlay allows iPhone users to access contents such as Apple Maps, Messages, telephone calls, Apple Music, also with Siri voice assistance. A number of members have the car on order and have been promised that delivery is imminent, with the first cars just arriving in the UK. Research also brought along an example of the 124 Spider. It turned out to be the only one present, which was a bit of a surprise, as the model had finally reached customers in the UK at the end of September 2016, and it was claimed that the first shipment of cars had all been pre-sold. More have since arrived in the UK, and whilst there are not huge numbers of owners on the various Facebook Groups and the Forum , there are some. No doubt as the summer progresses, more will find favour among those who crave an open-topped sports car, and it is well documented that such cars do tend to sell better in the summer months, than in winter. The Abarth 124 Spider was developed in parallel with the Fiat model. It does cost a lot more, and there are those who think you don’t get enough extra for your money, but those who have driven it will tell you otherwise. You certainly get more power. The 1.4 MultiAir turbo unit jumps up from 138bhp to 168bhp, while torque also increases by a modest 10Nm to 250Nm, which gives it a 0-62mph time of 6.8 seconds, which is half a second quicker than the 2.0-litre Mazda MX-5. The top speed is 143mph. It weighs just 1060kg meaning a power-to-weight ratio of 158bhp-per-tonne, and with the new Record Monza exhaust system it sounds great even at idle, as the Abarth UK staff demonstrated many times during the evening. The Abarth version gets a stiffer suspension setup than the regular Fiat 124 Spider, with Bilstein dampers and beefed-up anti-roll bars. Bigger Brembo brakes also feature, with aluminium calipers. It can be had with a six-speed manual or six-speed automatic transmission with paddles, and the latter gets a Sport mode for quicker shifts. The car seen here was sporting the ‘Heritage Look’ pack, which is a no-cost option. It brings a matt black bonnet and bootlid, plus red exterior trim detailing and is likely to be popular. The £29,565 starting price gets you standard equipment such as cruise control, climate control, Bluetooth, a DAB radio and satnav, plus Alcantara black and red (or pure black) seat trim. The automatic gearbox is a £2,035 extra, while an optional visibility pack brings LED DRLs, auto lights and wipers and rear parking sensors. There will be more powerful versions to come, including a monstrous 300bhp Abarth 124 Rally which was shown at Geneva earlier this year. Far more numerous were the Series 4 versions of the 595. These have been available since about June 2016, and with Abarth sales have increased massively during the past 12 months, thanks largely to the appointment of a considerably larger number of new dealers, it was no surprise to find that a significant number of these latest models were here. Some belong to owners new to the brand, and others are the latest upgrade from people who have had one or in some cases, more than one Abarth before. The most significant changes with the Series 4 are visual, with a couple of new colours, including the much asked for Modena Yellow and a different red, called Abarth Red, which replaces both the non-metallic Officina and – slightly surprisingly – the tri-coat pearlescent Cordolo Red. as well as styling changes front and rear. When first shown, plenty of people, me included, were unsure as to whether the new look was a Good Thing or not, but as the cars become more evident, then familiarity does help get used to the alterations. At the front, the new air intake allows around 15 – 20 % more air in and out, which will be welcome, as these cars do generate quite a lot of heat under the bonnet. Competizione models for the UK retain the old style headlights, as they have Xenon lights as standard, whereas the Custom and Turismo cars have reshaped units. At the back, there are new light clusters and a new rear bumper and diffuser. Inside, the most notable change is the replacement of the Blue & Me system with a more modern uConnect Audio set up, which brings a new colour screen to the dash. Mechanically, there is an additional 5 bhp on the Custom (now 145) and Turismo (now 165 bhp) and the option of a Limited Slip Diff for the Competizione, which is likely to prove a popular option. Details of the interior trim have changed, with a filled-in glovebox like the US market cars have always had, and electric windows switches that are like the US ones, as well as a part Alcantara trim to the steering wheel in Competizione cars. Certainly the new red colour looked good, and is expected to be a popular option, and Modena Yellow seem to have taken over as the most popular colour of the lot, displacing the still-available, and still popular Podium Blue. Needless to say, these cars created a lot of interest throughout the day. Although the ratio is changing fast, the majority of cars present were earlier versions of the 500 and 595. Marque experts will know that these can be categorised in three Series, though visually, there are only very small details to tell them apart. When the model was first launched, there was only version as shipped ex- works, called the 500. It had a 135 bhp 1.4 litre turbo-charged engine coupled to a five speed manual gearbox, with 16″ alloys as standard, and the option of 17″ wheels, and a colour palette comprising of two whites (BossaNova White, the standard colour, or the pearlescent Funk White), Red (Pasadoble), Pale Grey (Campovolo) or Black. If you wanted more power – 160 bhp – then you could order an Esseesse kit, which came in a large wooden crate, containing new wheels, springs, an ECU upgrade, the Monza exhaust system and badging. It was dealer fitted and could be applied at any time within the first 12 months or 10,000 miles from registration. Needless to say, it proved popular. As were many of the optional extras, with stickers for the sides, a large scorpion for the bonnet and even a chequered pattern for the roof among the personalisation options offered. Several of the original style of cars were here, mot of them still looking almost like new even though the oldest cars are now somewhere between their 7th and 8th birthdays. Whilst a sliding glass sunroof (Skydome in Fiat/Abarth parlance) was an option from inception, fans of open air motoring had to wait until Geneva 2010 for the launch of the 500C models. For the first few months these cars only came with the robotised manual gearbox, which limited the appeal in the eyes of some, but they also introduced us to the “bi-colore”, a series of two tone cars, with upper and lower halves of the body painted in different colours. It took us a while to get used to this, as no other production road cars had been painted like this for some time, but now this is seen as yet another of those marque defining attributes, and (perhaps with the exception of the rarely seen Rally Beige and Officina Red combination that would come for 2014) in the eyes of many this distinctive look enhances the appeal of the cars still further. Having used the legendary 695 badging from the 1960s on the Tributo cars, at the 2012 Geneva Show, Abarth dusted off the 595 name that had been used on the less powerful of the Nuova 500 based cars of the same generation, and created two new versions which we should think of as Series 2 cars, the 595 Turismo and Competizione, both of which could be bought in either closed or open top C guise, with either the 5 speed manual or robotised automated gearshifts. Both models had the 160 bhp engine as standard. Effectively they were a replacement for the Esseesse kit, and it meant that the cars were produced complete at the factory, rather than needing the dealer to undertake the upgrade (and the associated paperwork), though Abarth did not withdraw the Esseesse kits from the market for some while. Turismo, as the name suggests was aimed slightly less extreme in intent, featuring standard leather upholstery, upgraded dampers and climate control, Xenon headlights and Alutex interior details. The sportier Abarth 595 Competizione replaced the leather seats with Sabelt cloth sport seats and Alutex with aluminium, while adding p-cross-drilled brakes and the Record Monza dual-mode exhaust. Some new colours were introduced, and very soon one of those, Record Grey, frequently combined with a tan interior became one of the most popular choices. Some of the other new ones proved to be more of an acquired taste. Legends Blue, a very pale colour was moderately successful, though there were a couple of cars in that shade present on this occasion, and they do look rather nice. Rally Beige, a sort of weak cappuccino colour remained one that few selected, and that was also unrepresented here. The standard “no charge” colour has changed over the years, from Bossa Nova White to Campovolo Grey, to Pasadoble Red and now Circuit Grey, and this does also have an impact on which colours become more or less popular. Rumours started to circulate towards the end of 2014 that Abarth were going to upgrade the Competizione model, so as better to bridge the gap between the Turismo and the 190 bhp 695 Biposto that had been added to the range earlier in the year. It was Geneva 2015 when the result was finally shown to an expectant fan base. Most exciting news was that thanks to a bigger Garrett Turbo, the engine had been tweaked to 180 bhp, and with reduced CO2 emissions. A standard spec that included Koni Dampers, Brembo brakes, Xenon lights, Sabelt seats, Climate Control, parking sensors as well as other refinements that had been added like the TFT instrument display all proved very compelling, so not long after the first cars reached the UK in June of 2015, I found temptation too hard to resist, and as is well documented here, swapped my 2010 car for one of these. At the time I ordered it, Cordolo Red, a tri-coat pearlescent paint which shimmers in bright sunlight looked set to become one of the most popular colours of the lot, even though it is a cost option. Indeed, the Launch Edition models were all offered either in this colour or Scorpion Black, with black wheels. Surprisingly, the colour has not been carried over to the Series 4 cars. A new colour was announced with the new Competizione cars, called Podium Blue, but it was not going to be immediately available, and there were no accurate representations of exactly what shade it would be. Rumours circulated on Abarth forums and Facebook Groups all summer, with lots of guessing and no real facts, although we had been assured that it was not the same as the Abu Dhabi Blue that had featured on a very small number of 695 Tributo Ferrari models in 2011. It was October when the first cars reached the UK and those who had taken the gamble could see for themselves whether they had got it right. Common consent is this is a stunning colour. A rich blue, it changes shade in different lights. I think it looks fantastic, and many clearly agreed, as in 2016. it became the most popular colour. Long time Abarth owner and enthusiast, Ed Tan, clearly thought so, as when he ordered his fourth example of the marque, he selected this colour for his 595C Competizione, which was here for everyone to admire and there were several other cars also looking at their very best in the sunshine. There have been a number of Limited Edition models throughout the 500’s life, and surprisingly, there were none of them here. First of these were the Tributo Ferrari models sold in 2010 and 2011, released successively in 4 different colours. They were eye-wateringly expensive when new (around £36k), and many have since been exported, so you don’t come across the very often these days, though there was one model here with the distinctive twin central stripes on as a reminder of what they looked like. More surprisingly, there were none of the top of the range 695 Biposto cars here, either. These first appeared in 2015, and the “standard” car was only available in Performance Grey. A very limited quantity were produced in red and them there was also a Record Edition in what was then a unique colour of Modena Yellow. First shown at the 2014 Geneva Show, this 2 seater (that’s what Biposto means in Italian) is nothing other than a road legal version of the 695 Assetto Corse Racing car, a vehicle which has its own race series in Europe. Although the car is road legal, it was envisaged that the majority of people who buy one of these cars will use it on the track and quite frequently. So it was conceived accordingly. That means upgrades to all the important bits – engine, brakes, suspension, gearbox – and some fairly drastic measures to save weight which resulted in a car which generates 190 bhp and 199 lb/ft or 250 Nm of torque with a kerb weight of just 997kg. That’s enough to give a 0 – 60 time that is under 6 seconds, and a top speed of 143 mph. Those are supercar figures produced by a city car. There’s more to it than that, though, as the changes that go to make a Biposto are extensive, and they have been well thought through, so this is a long-way from being a hastily conceived or tuned up special. Ignoring the limited edition cars which arrived during 2015, the “regular” Biposto is only offered in Matt Performance Grey paint, and the car is visually distinctive, with a new front bumper, rear diffuser, wider arches, new skirts and bigger roof spoiler. Although the engine is still the same 1.4 T-jet that features in the lesser 500 and 595 cars, it has been reworked here, with a new Garrett turbocharger, larger intercooler, altered fuel rail and an Akrapovic exhaust system. Buyers can choose between the standard five speed gearbox or an optional race-bred dog-ring unit mated to a mechanical limited slip diff. The standard car’s MacPherson strut and torsion beam suspension has been reworked, too, with altered springs, wider tracks adjustable ride height and dampers with more resilient bushings, using Extreme Shox technology shock absorbers. The brakes are upgraded in line with the extra power, featuring 305mm Brembo discs and four pot calipers up front and 240mm discs with single pot calipers at the rear. The wheels are lightened 18″ OZ and attached via a titanium hub, shod with bespoke 215/35 Goodyear tyres. In the interest of weight saving, a number of standard trim items are removed, including the regular door trims, air conditioning, the rear seats and some of the sound deadening material. Even the standard air vents have been changed so they are covered by a simple mesh. In their place is plenty of polished carbon fibre, a titanium strut brace, racing seats and harness, as well as special trim features such as new pedals, tread plates and a race inspired digital display on the dash where the radio usually sits. Only a small number have been sold in the UK, and of these quite few were bought for export, so this is and is likely to remain a rare car. Although many of the cars to be seen here did look standard, several have received a range of modifications from their owners. Some of the changes are quite subtle, but others are very significant indeed. None more so than Laura Croft’s car. What started out as a regular white 595 Competizione has been changed both in appearance and mechanically. And she continues to alter things. Last year the distinctive large orange side stickers went and the car reappeared, having had a wrap in a very distinctive shade of greeny-blue. As if that is not sufficient to draw attention to it, the air suspension, when demonstrated is always a crowd puller and the sound system she has put in would wake the dead from 100 miles. At the beginning of the 2017 season, the new colour was revealed to be a rather nice wine red. Well, I thought it was nice, on the couple of occasions that I saw, but clearly it was not quite what Laura wanted after all, and after a few weeks, she announced that livery number 4 was in gestation. And here it is: a mix of two colours, split down the middle of the car, something that no manufacturer has yet offered. It attracted lots of attention, as you might expect. Another car which created lots of interest, and which was making its first ever appearance at a UK event was Ben Au’s rather fabulous 500GTO. No, Abarth did not make such a car, so this is the result of something that Ben conceived himself. The car started off life, in Hong Kong, as a regular 595 Competizione, but over the last year or so, he has systematically worked on everything from the paint finish that recalls the recent Ferrari 599 GTO, to what lies under the bonnet. It was a deserved winner of the “Car of the Day”, as voted for by all the attendees. This being an event organised by Modified Abarth, there were plenty of other cars which have undergone significant change from when they left the factory. In some cases, the alterations are all mechanical, and are not necessarily that obvious from a quick glance, unless the bonnet happens to be raised. Others reveal at least of their changes just by looking at them, with everything from front splitters to different tail pipes, and just about every aspect of the car in between. Many of these have evolved over time, as their proud owners experiment with something different. It never seems to amaze me just how creative, and indeed how deep the pockets of some of the owners seem to be. The Punto was the first car to appear in Abarth guise, but once the 500 came on stream, it was always somewhat over-shadowed, certainly in sales terms, with around 10 times as many 500s finding buyers as Punto models. And with production having ceased at the end of 2014, and sales of the 500/595 cars having increased, that ratio now tends to appear even wider when you get Abarths gathered together. In fact, 10 Punto models here is a better percentage than that of those registered to UK roads. Surprisingly, there none of the earlier Grande Punto, as all the cars were the later Punto Evo models. The Abarth Grande Punto debuted at the 2007 Frankfurt IAA Show, going on sale in the UK in late summer of 2008. Offering 155 bhp from its 1.4 litre T-Jet engine, coupled to a six speed gearbox, and riding on 45 profile 17″ alloys, the standard car got rave reviews from the journalists when they first tried it, and they were even more impressed by the changes wrought by the optional Esseesse kit. This increased power to 177 bhp, brought 18″ OZ lower profile wheels, whilst new springs lowered the ride height by 15-20mm, and high-performance front brake pads and cross-drilled front disc brakes helped the car to stop more quickly. The most distinctive feature of the car were the white alloy wheels, though, as owners found, keeping these clean is not a job for the uncommitted, and many have a second set of wheels that they use fro grubbier conditions. 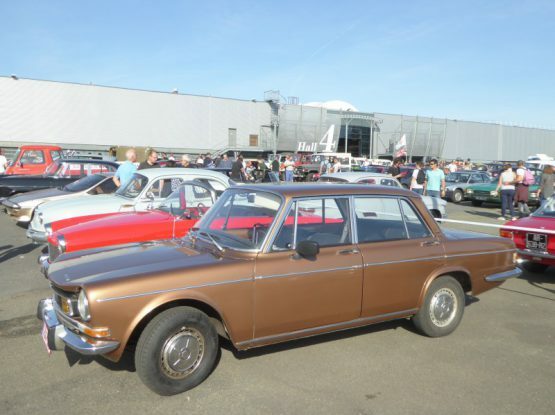 Despite the positive press at launch, the car entered a very competitive sector of the market, and the combination of being relatively unknown, a limited number of dealers and the existence of established rivals from Renault and others meant that this always remained a left-field choice. The owners loved them, though, and they still do. The oldest cars have now had their 8th birthdays, and some have amassed relatively big mileages, but they are still a car for the cognoscenti. To create more interest in the model, in 2012 Abarth introduced a limited edition version called the SuperSport. Easily identified by the distinctive black bonnet, just 199 of these were built, of which around 120 are registered on UK roads. 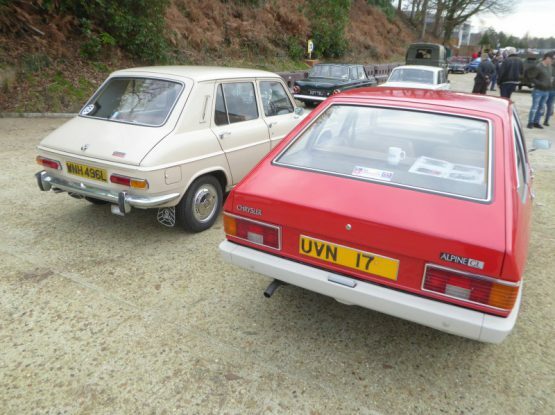 These cars had many of the options from the Punto Evo included as standard. Power came from the the 1.4-litre MultiAir turbo engine, tuned to produce 178bhp and 199lb ft of torque, up from 165 of the standard Punto Evo, giving the SuperSport a 0-62 time of 7.5 seconds and a top speed of over 132mph. To help put the power down, the SuperSport was fitted with wider 18″ wheels and optional Koni FSD dampers. Standard equipment included the Blue&Me infotainment system with steering wheel controls, automatic climate control and a popular option was the ‘Abarth Corsa by Sabelt’ sports leather seats. The SuperSport was available in the same colours as the regular Punto Evo, which means white, grey, black and red. The last of these is the rarest by some measure, so it was good to get one those as well as the Campovolo Grey car for the event. Universal opinion was that this was a good day out. In 2016, the second event attracted more cars than the first (inevitably, as the first was in February, when it was rather cold, the second in a more temperate July) but even so it was clear that there was space for more. We wondered how many more. Now the answer is known, as about 115 Abarths constitutes capacity. And if anyone thinks that 115 Abarths might not be all that interesting for all but the die-hard enthusiasts, them having read this report, and see the pictures of such a variety of cars, it will be clear that this would be the wrong mis-giving to form. Clearly with a group of enthusiastic owners, some of whom I have known for years, and some of whom I only met for the first time at this event, then there is plenty to fill the entire day. I have no doubt that Modified Abarth will be running something very similar in 2018. Watch this space.